NanoCal is a supplement that has been approved by the US FDA as a CURE for osteoporosis and osteoarthritis. NanoCal can actually reverse and preventing these conditions! – General calcium supplements have only approximately a 21-37% absorption rate due to larger calcium particle sizes and shapes. The remainder of the calcium can cause unwanted side effects. 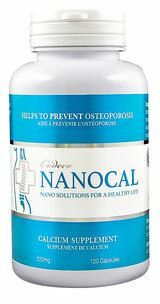 NanoCal is 100,000 times smaller in particle size, delivering a nearly 100% absorption rate. – Published studies show that calcium deficiency is directly related to low bone mass, bone loss and high rates of bone fractures. Calcium intake is considered a vital part of a healthy diet, but taking non-absorbent calcium can cause side effects and kidney related problems. – This is why it is important to select a calcium supplement that will provide high absorption rates while regulating intake volume. Such a supplement should have seamless absorption, direct and demonstrated effectiveness, and an extremely low instance of side effects. Codeco NanoCal delivers these requirements.